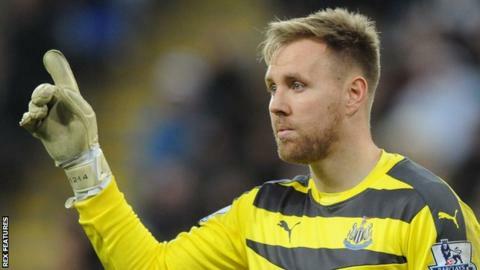 Newcastle United success in the FA Cup would be so big to supporters they would need a "national holiday" to celebrate, says goalkeeper Rob Elliot. The Magpies have not won a major trophy since lifting the Inter-Cities Fairs Cup in 1969, but have been in four finals since, losing them all. Newcastle begin this season's FA Cup campaign in the third round at Watford. "The opportunity to win silverware for Newcastle, you can't imagine what it'd be like," Elliot told BBC Newcastle. He joked: "There'd have to be a national holiday for all Geordies. "For players it's a genuine opportunity, you go through your career and only about 10% of players ever win anything, especially at this level because there are only four trophies up for grabs." Kenny Dalglish and Ruud Gullit led the Magpies to consecutive FA Cup finals in 1998 and 1999 respectively, although losses to Arsenal and Manchester United extended their trophy-less run. Since arriving at St James' Park from Charlton in August 2011, Republic of Ireland international Elliot has yet to win an FA Cup tie in Newcastle colours. The 29-year-old is a fan of the competition, citing Wigan's success in 2013 against Manchester City as an inspiration for his own ambitions. "I've always enjoyed the cup games because they're brilliant games to play in, they're end to end," he added. "You can forget about everything else and it's just 90 minutes and off we go."